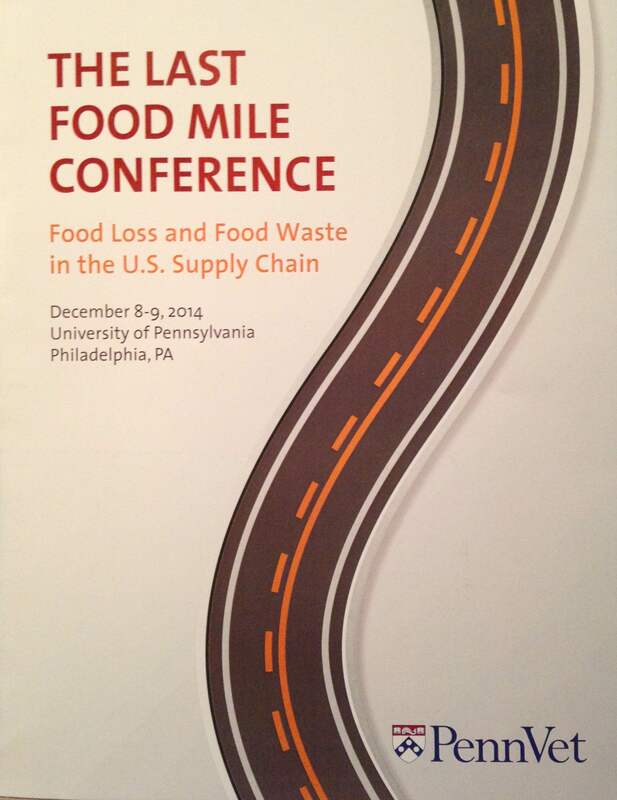 I was very pleased to partner with Zhengxia Dou and colleagues at the UPenn Vet School in hosting The Last Food Mile conference in Philadelphia last week right in the heart of the Penn campus. The conference was designed to take a deep dive into food loss and wastage across all aspects of the US supply chain, and indeed it did. Roughly 200 participants were treated to 30+ thought leaders covering multiple aspects of the food waste problem, including loss and waste occurring in production, at retail, and at the consumer level. After investigating causes of food waste across the supply chain, we also explored food recovery and recycling efforts as well as key issues in behavior change. Through its role in ensuring the health of livestock populations, Penn Vet is active in food security issues — and that extends to the problem of food waste as well. One key step toward ensuring food security, particularly as we face the challenge of feeding two billion more global citizens by 2050, is to make better use of current food resources — and that involves reducing food loss and waste. We began with an overview of the challenges and opportunities in feeding nine billion people by 2050, followed by presentations from both FAO and USDA. We then looked at food loss and waste with an industry focus, with discussions headed by a leading grower (Sterman Masser Farms), a leading manufacturer (Campbell Soup), and a leading retailer (Ahold USA). A representative from DuPont then discussed the potential for food packaging innovations to reduce losses through extended shelf life. We then moved to the consumer level, covering issues leading to food waste in the restaurant sector and in the home. This session included a global perspective, with lessons on quantifying and reducing food waste from WRAP (Waste and Resources Action Programme) in the UK. Discussions by representatives from LeanPath and USEPA explored methods for reducing food waste in food service operations and in households. We concluded day one with a “hands-on” perspective of food redistribution and recovery with representatives from AmpleHarvest.org and Rolling Harvest Food Rescue. Bon Appetit, our partner and food service provider for the event (and a leader in sustainability initiatives), provided an excellent display of its “stem to root” program which involves making use of all edible parts of food items (many of which are often discarded by other food preparation entities). Our second day began with a focus on food waste reduction, recovery, and recycling. We heard from Feeding America as well as from Bill Clark, former CEO of Philabundance, who developed an innovative food store concept (Fare & Square) to overcome the lack of access to nutritious food in an urban food desert just below Philadelphia. In addition, Doug Rauch, CEO of Conscious Capitalism, covered his innovative store model (Daily Table) designed to bring affordable, nutritious food to low-income individuals the Boston area. Mike Waldmann of the Society of Saint Andrew — America’s largest gleaning organization — discussed several challenges of the food system that result in food not getting to market and SOSA’s role in capturing it for redistribution. We then moved to a panel on behavior change, which will be critical for driving reduction of food waste and losses across the supply chain. Since consumers must drive that change, we began with a discussion of the psychological basis of food wasting behavior with Paul Rozin of UPenn. Additional discussions focused on the impact of food marketers on consumers as well as legal issues impacting food labeling and food donation/recovery efforts. We concluded with a moving perspective on food waste in urban schools from a group of middle school students, followed by a view of food waste in college dining halls from a UPenn student research team. A link to the conference can be found here, and a link to the agenda can be found here. In addition, abstracts from the many speakers can be found here. The atmosphere over the two-days was one of very high energy — the conference participants are clearly excited to be engaged in such a critical topic with huge social, environmental, and security implications. There was a clear sense of momentum as well as The Last Food Mile closely followed conferences and events on food waste in Oakland, Chapel Hill, London, New York, and The Hague. While raising awareness of the problem of food waste across the supply chain is critical (and the need to do so will continue for years), we hoped to provide several examples of current efforts to minimize food loss and waste. We are committed to using this conference as a launching pad for future research, papers, events, and conferences to continue advancing solutions toward reducing food waste and losses in developed (and less developed) countries. Stay tuned. More to follow.